In this issue, we bring to you high hopes and big plans for the new Fall 07-Spring 08 programming season plus pictures and recaps from our last big season which ended in a spectacular culminating event at the Thoreau Center in June. Our newest Board members: Georg Gottschalk and James Joves. An Auction in the works – Volunteers and sponsors needed! ArtSeed Wishlist – more opportunities to help! Georg Gottschalk brings to ArtSeed a background in business and a love for the arts. He is currently a Program Director in IBM’s Software group where he manages a global business with a multi-million dollar revenue target. He is deeply interested in the art of the early/mid 20th century (primarily works on paper), modern architecture and design. He is also on the board of the Achenbach Graphics Arts Council at the Palace of Legion of Honor and de Young Museums. James Joves has been volunteering with ArtSeed for the past few months, dazzling us with his to-the-point style and swift follow-up on tasks. His love for the arts is coupled with a background in business and marketing, development, operations and finance primarily in the life sciences field. He is currently assistant CFO for the UCSF School of Pharmacy. Also please welcome our new ArtSeed Youth Council Members: Michelle Quan, Secretary; Jiana Watson, President; Cole Ferraiuolo, Treasurer; Maxx Gavrich, Development/Programs Officer. Welcome! We have started the ball rolling for our next big Auction Fundraiser for Spring ’08. ArtSeed has been offered generous donations by Tony Grant, who has stewarded and researched the sculptures and paintings by his father, the late James Grant – a prominent but often overlooked artist working in California during the 50’s-70’s who died ten years ago. Jim’s work will be featured alongside other distinguished artists’ works, both late and living, both old and young. ArtSeed will preview and auction several of Grant’s works prior to a retrospective, which is also in the works! We are currently looking for sponsors for this event (e.g. sponsors, in-kind gifts, catering, auctioneer) as well as donations of other non-art auction items (e.g from unique experiences to gift certificates and objects) as well as event planning and event day volunteers. If you would like to help, please contact ArtSeed. For the first time and starting this 07-08 school year, ArtSeed artist Marissa Kunz will be fulltime artist-in-residence at Sherman Elementary School. This move was made possible in part by the Sherman PTA and an award from the California Arts Council Artists in Schools Program. This generous grant will also allow for continuing art classes at Burnett Child Development Center with artists Patricia Diart and Josefa Vaughan. Burnett will receive two hours of art classes weekly and all of Sherman’s 400 students will receive weekly art instruction based on the California Content Standards for Visual Art. We have also been addressing various sub-themes which are reasearched by by our collaborators from World Savvy. ArtSeed’s Education Program is the beneficiary of the upcoming Spring auction event. And it happens that this year’s theme, “Here After; Futures With Which We Can Live” brings into classrooms exercises inspired by original artworks by James Grant. Discussions related to the field of philosophy (our annual themes always reference other professional fields) become spring boards for students learning to appreciate the role of fluency in abstraction in describing inner worlds and making representational art look most real. ArtSeed’s Wishlist – here’s where you can help! Volunteers for: November 3rd and 4th Open Studios (studio sitter, art sales), data entry, classroom teaching assistants, artist mentors for youth, office management assistance, facilitating of ArtSeed retreat, new board member recruitment, grant research and writing, assessment of programs, new brochure design, auction branding and outreach, event planning. ArtSeed’s annual exhibition was held at the Thoreau Center Gallery in the Presidio for the second year in a row. The show which ran from June 28 – Sept 7, featured artwork made by distinguished Bay Area artists who have worked with ArtSeed, as well as student work from Kindergarten to High School. Student works were given professional presentation with glowing feedback from gallery visitors and Thoreau Center tenants. Many of the works sold, greatly increasing the excitement for our young (and not so young) participants! Several viewers to to the show, when informed that their favorite pictures were already sold commissioned new works by ArtSeed students. The opening night provided for the perfect culminating celebration of hard work and accomplishment from all of our programs including the Young Artists at Work Program, The Apprenticeship Program, the After-school Art Programs at Sherman, Burnett and the Summer Intensive. 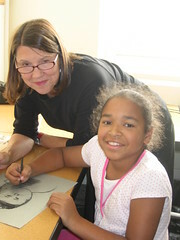 Works from the Young Artist at Work Program can be seen on our photo gallery. This was an extraordinary opportunity open to all interested artists and volunteers and a maximum of 10 students – ages ranging from 6 to 12. Each day, 9am-5pm, students worked alongside and received one-on-one attention from artists, volunteers, and high school interns from ArtSeed’s Young Artist at Work Program. This year’s Intensive accomplished a lot in a very short time. Each day’s activities were based loosely around an idea pertaining to the larger theme and included morning warm-ups and closing reflections. The curriculum was designed to include a broad range of activities including collaborative and independent hands-on artistic practice, fieldtrips to artist studios, galleries and museums, guest artist presentations, behind-the-scenes exhibition preparation as well as fun and games. Lead artist-teachers Marissa Kunz and Ann-Marie Stoehr led art activities in the bright and spacious Creativity Fitness Station set up for ArtSeed in the San Francisco Presidio’s Thoreau Center Seed Gallery. Already former and new parents who’ve heard about the intensive through word of mouth are inquiring about next year’s Intensive! Be sure to see the photos! We would like to Acknowledge new ArtSeed participants: Thank you for your support! Thank you for all you have made possible! Have a wonderful, restful and blessed holiday! ArtSeed is a grassroots tax-exempt nonprofit organization with a mission to bring artists into the lives of children in distressed communities. Our Education, Exhibition and Apprenticeship Programs seek to connect and engage individuals from diverse backgrounds who wish to use their talents to inspire academic and professional achievement, self-betterment and an ever-expanding sense of belonging. ArtSeed programs admit participants regardless of any disability, race, color, creed, sexual orientation, political party, and economic, national or ethnic origin. ArtSeed is supported in part by The Yerba Buena Center for the Arts, LucasFilm Foundation, Wells Fargo Foundation, Shipyard Trust for the Arts, Tony & Caroline Grant, Karl & Sally Hufbauer, Anna-Lisa & Steve Froman, Donna Logan, Alan & Cynthia Coleman, Marlis Baraka, Nancey Gagos, and other generous individual donors, the Terzian Family & The Point at Hunters Point Studios and The California Arts Council Artists in Schools Program. Join us in celebrating ArtSeed’s annual exhibition of artwork made by distinguished Bay Area artists who have worked with, will work with, or have inspired children and youth. The exhibition includes student work from Yerba Buena Center for the Arts Young Artists at Work Program, Burnett Child Development Center, Alvarado and Sherman Elementary Schools, ArtSeed’s Open Studios at the Hunters Point Shipyard, and ArtSeed’s Apprenticeship Program. This year’s students explored the theme of governance in their work, leading the students to contemplate more deeply the choices they make and the need for communities to build problem-solving structures to sustain a healthy world. Where: Thoreau Center Gallery in the Presidio of San Francisco. Building 1014 (Lincoln Boulevard and Torney Ave) Visit Artseed.org for directions. Also note that the Gallery is open to the public weekdays, 8:30am-5:30pm. The ArtSeed Summer Intensive was a blast. Below are some pictures to give you a peek at what we did from 9-5 everyday for 6 days! Then come see our framed artwork in the Thoreau Gallery Opening! More details in our upcoming newsletter! part of our operation. Thank you! ArtSeed is a volunteer-based and tax-exempt nonprofit charity. Our mission is to bring diverse communities together through innovative fine arts projects and long-term artist/youth studio apprenticeships. Our programs foster pride and professionalism, nurture tolerance and leadership while inspiring a life-long love of learning. ArtSeed programs admit participants regardless of any disability, race, color, creed, sexual orientation, political party, and economic, national or ethnic origin. • When we say that all gifts (no matter the size) count, we mean it! So does the IRS. ArtSeed’s Form 8734 Support Schedule has passed the IRS 501(c)(3) Five-Year Advance Ruling Period Review and we have received our official letter verifying that we have met all the requirements of a publicly supported organization. The primary requirement was that at least 50% of our income be donations of comparably modest size from individual donors. Our records show that we are almost at 90%. Congratulations to all of you ArtSeed supporters! • ArtSeed is being exhibited in Turkey! Josefa Vaughan, ArtSeed’s Executive Director is going there May 20- June 10 as an envoy spreading and gathering ArtSeed ideas related to this year’s theme: Governance, Identity, and the Creative Process. Our students from the Yerba Buena Center for the Arts Young Artists at Work (YAAW) Program and from our after school program at Burnett sent postcards to Istanbul in response to artist Peter Hristoff’s call for entries to Moons and Stars Project. Participants of this exchange were asked to illustrate their perceptions about each other. You can see our offerings in the gallery page on our website. Exhibition dates and venues are posted on moonandstarsproject.org. • Hundreds of pre-K students at Burnett and neighboring Grace CDC experienced a very special Valentine’s Day concert by the all women Tuvan Throat-singing band, Tyva Kyzy. Former ArtSeed teaching artist, Devan Miller organized their west coast tour the group and helped to introduce their unique instruments (kids got to touch them!) and afterwards lead a discussion about the singing techniques. Some children thought it sounded like bugs and other animals. For more information visit: tyvakyzy.com or tuvatrader.com. • ArtSeed branches out! 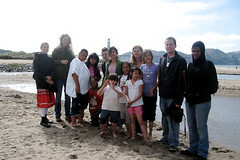 In an ongoing initiative to connect with and serve out-lying rural (as well as urban) areas, representatives from ArtSeed and the San Francisco Art Institute lead workshops on art and sound with a follow-up critic of artwork by high-schoolers at the Pacific Community Charter School in Point Arena, CA on April 9, 2007. • Encore! The Achenbach Graphic Arts Council requested a return visit to the Shipyard Studios Gallery exhibition they inspired. Both receptions included a “walk about” with artists featured in the ArtSeed Range installation of works on paper. Currently ArtSeed has work on display through May 31 in the World Savvy installation at the Crissy Field Center. Check it out! • Bayview Hunters Point Shipyard Spring Open Studios is this weekend: 1-7pm Friday April 27 Preview and 11am-6pm Saturday and Sunday April 28 and 29. Visit us in Building 101, Studio 2513. For directions visit springopenstudio.com. • Mother’s Day, May 13, ArtSeed will lead two Family Day workshops at the Asian Art Museum from 11am to 4pm. Come make kites and work with clay! For more info go to asianart.org. By the way, Josefa is now a grand mother! ArtSeed’s website designers Arwen and Heather Vaughan brought into the world a beautiful little girl named Roan. Click here to see photos. • There are still a few openings left for participants in ArtSeed’s Annual Summer Intensive Camp, June 13-20. Applications are up on our website. Also, mark your calendars for ArtSeed’s upcoming Thoreau Gallery Exhibition opening reception June 28. • Big Thanks are extended from those of us on ArtSeed’s Board of Directors to our funders especially to those who have sent funds to help match our recent California Arts Council grant. (We still need help to satisfy this commitment!) Special thanks to all our volunteers especially Allerton Steele, Joan Nelson, Tim Armstrong, Kevin Zhou and Sally Allen. We are in debt to our in-kind donors such as DC Spensley (donated a computer to establish a digital art center at Burnett. Anyone got a printer?) Plus big in-kind hugs to the late Kean Brewer and his partner Jim Laufenberg, Terry Horrigan, Kevin Quan, Artist & Craftsman Supply, Under One Roof, Ritz Camera, and Frames on 3rd. • Tagger turns classical music aficionado! ArtSeed’s YAAW student Christopher So at first declined the invitation to hear the SF Youth Symphony’s March 11 performance of Webern’s Passacaglia, Mozart’s Sym. #39 and Mussorgsky-Ravel’s Pictures at an Exhibition. Apparently Christopher “wasn’t feeling it” during a school field trip to Davies Hall years ago. But this time, sitting on the edge of his seat in the second row, one could see the whites all around Christopher’s eyes. Josefa said: “This ain’t no elevator music.” The next day in class Christopher wrote: “I was lying in my bed, and soon after, realizing there in my head I was still hearing the music, after many hours.” Here’s to feeling it! ArtSeed is a volunteer-based and tax-exempt nonprofit charity. Our mission is to bring diverse communities together through innovative fine arts projects and long-term artist/youth studio apprenticeships. Our programs foster pride and professionalism, nurture tolerance and leadership while inspiring a life-long love of learning. ArtSeed programs admit participants regardless of any disability, race, color, creed, sexual orientation, political party, and economic, national or ethnic origin. ArtSeed is supported in part by The Yerba Buena Center for the Arts, LucasFilm Foundation, Wells Fargo Foundation, Shipyard Trust for the Arts, Tony & Caroline Grant, Karl & Sally Hufbauer, Anna-Lisa & Steve Froman, Donna Logan, Alan & Cynthia Coleman, and the Terzian Family & The Point at Hunters Point Studios and The California Cultural Arts Council Artists in Schools Program. That is if we wanted to keep our small Presidio office and current level of programs intact for 2007. In the face of this financial hurdle, Josefa was somehow optimistic. And indeed – one Winter Sioree Fundraiser later plus a letter of appeal to our patrons – donations began trickling in slowly but surely until in early January (about 8 weeks later) we reached our goal. It is this kind of grassroots support that keeps us alive through the ups and downs of grant availability. To all our supporters: thank you for making the work that we do possible year after year!But that is not all. We now have a chance to expand or programs as well. We have been awarded a matching grant from the California Arts Council (CAC) to develop a project that connects students from diverse neighborhoods through three free after school programs. Burnett Child Development Center has awarded ArtSeed its own classroom that, thanks to generous individual gifts of supplies from friends like you, a professional artist studio will be available to mentoring artists who will work with individual teachers and families after school and teach classes if we can raise funds to match this CAC grant. ArtSeed affiliate sites, Sherman and Alvarado Elementary Schools, will participate as “pen pals” exhibiting their art together with Burnett in June. We are now trying to raise the cash match of $3,000 – $5,000 to ensure the grant can be put to use. 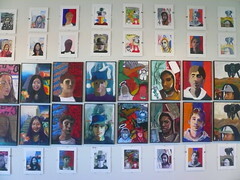 If you are interested in helping with this particular effort you may donate at ArtSeed.org and indicate matching grant. This February, ArtSeed will have the honor to host members of the Achenbach Graphic Arts Councilfor a private showing of ArtSeed’s works on paper. 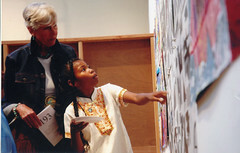 The members of the council are patrons and collectors with a particular interest in works on paper (prints, drawings, photographs, etc) and are supporters of the Achenbach Foundation for Graphic Arts (AFGA) – the most comprehensive collection of works of art on paper in the western United States. The ArtSeed tour will be led by Josefa at the Hunters Point studio and gallery on Feb 21, 2006 and will feature some of our best mentoring and supporting artists and students along with pieces from our own individual collections. For all others interested, the show will remain up and available for viewing by appointment from Feb 19-April 1. Bayview Hunters Point Shipyard Spring Open Studios is just around the corner. This year’s over arching theme relates to governance, identity, and the creative process. We are looking for a curator for this April 28th-29th annual event. Got ideas? ArtSeed Apprenticeships will have a brand new year-long pairing starting this spring thanks to a $2,500 donation from Tony and Caroline Grant. ArtSeed’s has officially begun its 2nd year of programming for the Young Artist at Work(YAAW) program at the Yerba Buena Center for the Arts – a highly competitive program for diverse and qualified Bay Area high school students This year’s theme – “If I Ruled the World” – touches upon issues of governance, identity and creativity. We are moving forth with our new after school programs and starting to plan for an exciting ArtSeed Summer Intensive and culminating Exhibition in June for all of our programs. We look forward to a great year! We missed those of you who could not make it to the December 9th ArtSeed Winter Sioree graciously hosted at the beautiful Hoover Residence in Pacific Heights. Fifty of our friends, patrons and volunteers however did attend and we all enjoyed an elegant night of Jazz, schmoozing, and delicious hors d’oeuvres including handmade Russian piroskis made by Justin and his grandmother. To see pictures from our Winter Sioree click here. Some of the ArtSeed crew will be going to see Tyva Kyzy, the all-women Tuvan throat-singing folk ensemble as they perform at the Great American Music Hall this Sunday February 11th at 7:30pm. More information.